This is one of the most unusual and compelling books I've read in a long time. The book is the printed version of Else Buschheuer's online diary, which she wrote between July and November 2001. She was working in New York for Aufbau, a monthly Jewish magazine. The diary covers her experiences of living in and loving New York and is full of her impressions of the city: the sightseeing she did, the culture, the people. Also the books she reads and the films she sees. She's also a bookcrosser at heart - at one point she leaves "White Teeth" by Zadie Smith at Newark Airport! Her language is unusual and playful. She makes up new words to express what she's feeling and experiencing. At times she writes without punctuation, almost like a stream of consciousness (which makes it hard for a non-German reader to understand!). She writes with humour, compassion and love of the city around her and its inhabitants. But there's another side. We know already what happens on 11th September, and as we read the diary through August and September, we sense the impending disaster, even though (of course) Else doesn't. The second half of the book is Else's experiences of the attack on the twin towers, her survival in a physical sense, but also her battle with the loneliness, fear and terror of this time. She mourns the physical loss of the towers from the New York Skyline. Her diary describes how this event changes everything, even her ability to read and enjoy books. It tells of her struggle to return to normality. An incredible book which I am offering as a bookring. “Dass sich dieses Tagebuch von einer Sekunde auf die andere in Ton und Inhalt vollstaendig veraenderte und zu einem bewegenden Zeit-Dokument wurde, konnte niemand voraussehen. 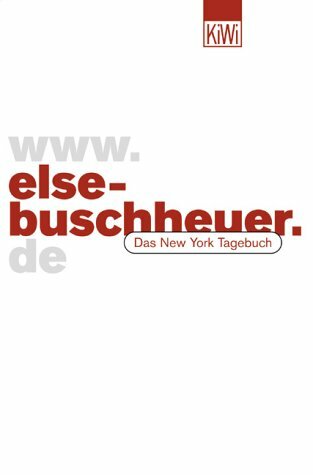 Else Buschheuer schrieb seit dem Juli 2001 ihre Aufzeichnungen aus New York und ueber New York, wo sie in ihrer Wohnung in SoHo dem Shock des 11.Septembers unmittelbar ausgesetzt war. Else's online diary can be read in German or English. And it seems she's still in New York! Das war mal etwas anderes! Toll geschriebenes Buch über New York und den 11. September. Ich fand den ersten Teil des Buches sehr amüsant und witzig geschrieben. Alles, was nach den Einträgen über den 11.09. kam, war eindrucksvoll und beängstigend zugleich! Tolles Buch! Es geht weiter, sobald sich ScottishHoosier gemeldet hat! Per Post an ScottishHoosier. Enjoy! Das Buch ist heute angekommen waehrend ich unterwegs war - schoene Ueberaschung! Und gute Timing - ich habe gerade gesternabend The DaVinci Code zu Ende gelesen. Vielen Dank nice-cup-of-tea und seacloud49. It took me much longer to read this book than I thought it would. The first half seemed to take an eternity. I don't really know why. Maybe I've been away from Germany too long and didn't know many of the cultural references any more, stuff about magazines, public personalities, TV. Suddenly it all went quicker as 9/11 approached. Although I was thousands of miles away in Scotland when it all happened, I recognized a bit of myself in what Else went through. Of course there wasn't the immediate personal danger that she went through, but I was mesmerized by the television and couldn't drag myself away. My son was just three months old, and the day of the attack my husband went offshore, so I could afford to sit in front of die Glotze the whole time. And cry. (Personal note: my cousin should have been on one of the WTC planes, but managed to get a spot on a plane the night before. She was stranded in LA for days and couldn't get home, but she was alive. Thank you, God.) After three days I realized what I was doing was unhealthy and forced myself to turn it off. Poor Else couldn't turn it off anymore. Now I'll have to check and see what Else is doing, how Else is doing. I sincerely hope that she has completely defeated her fears. I hope you enjoy this book, too. Once again, thank you nice-cup-of-tea for sharing. Now, I'll try to get this in the post tomorrow (cringe, is the last day of the month and the post office will be full of the blue-rinse brigade picking up their pensions), am going to fix the kids their dinner and have a nice cup of tea! I'm taking it to the post office today to send it on to KittyNic - enjoy! Added: Dropped it off at the post office this morning about 9:30. It's going first class to KittyNic. This arrived at the weekend whilst I was away at the Unconvention and has been added to my TBR pile. I've got two ring books I need to read before this one, but I'll try and get through those as quickly as I can. I am struggling with this one a little as my German isn't quite colloquial enough to understand some of the things Else is writing about. However, I will be giving it another go (with dictionery in hand) very soon. I've sent coolboxuk's address to kittynic today so am hoping this little book will keep travelling soon! Have pmed Kittynic again today to try and get the book moving again. the author's (mis)use of it. Now having made my complaint about the language, I got to about page 10, then skipped to the first entry of Sept 11th and read from there to the 18th, when Miss Buschheuer was well on her feet again - and the language slipped back into what I found simply too annoying to read. But the part in between was quite fascinating and I was well pleased with having joined this ring just for that bit of the "story", or better said report. It was very "close to the heart" and gave me a better insight than all the snippets I'd seen on TV. All the desperation, the total lack of understanding of what was going on and why, the insecurity and anxiety - all that came out very well in those passages. I'll pass the book on the Greenlands now.